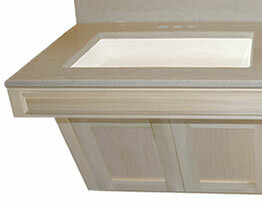 ADA Compliant Wheelchair Vanity Package includes: 30" Wall Mount Accessible Vanity, Cultured Granite Top with Integrated Backsplash and White Bowl. Choose from 3 door styles and 4 finishes. ADA Compliant Wheelchair Vanity Package includes: 36" Wall Mount Accessible Vanity, Solid White Top with integrated Backsplash and White Bowl. Choose from 3 door styles and 4 finishes. Wall Mount ADA Compliant Wheelchair Vanity Cabinet, unfinished Stain Grade, choose Flat Panel Shaker or Raised Panel Door style.